What is famine, and how can we stop it? Millions of people are at risk of starvation and death in South Sudan, Nigeria, Somalia, and Yemen. Organizations such as Oxfam and the United Nations are struggling to find the resources to respond to the catastrophic humanitarian situations in these countries in an attempt to head off outright famine. If you’re wondering, “what is a famine anyway?” here are a few things you need to know. Famine looks like a lack of food, and most people think it is brought on by a drought, a war, or an outbreak of disease. And some still believe in debunked 19th-century theories about “overpopulation” causing famine. But famines are usually caused by multiple factors, compounded by poor (or even intentionally bad) policy decisions that make people vulnerable. When no one addresses this vulnerability, it leads to famine. This is why political scientist Alex de Waal calls famine a political scandal, a “catastrophic breakdown in government capacity or willingness to do what [is] known to be necessary to prevent famine.” When governments fail to prevent or end conflict, or help families prevent food shortages brought on by any reason, they fail their own people. In Nigeria, the threat of famine is due to conflict between armed groups and the Nigerian military and has prevented farmers from growing any food in some northeastern areas for almost five years. Civil war in South Sudan and Yemen has also displaced families and cut off food supplies, as well as people’s access to aid. A lengthy, serious drought in Somalia has killed off most of the crops and livestock, the main assets for many families. The situation in Somalia is compounded by climate change and the effects of long-term conflict, which continues to make it difficult to get help to some of the hardest-hit communities. The conflict in South Sudan started in 2013, so it’s no surprise famine was declared there in Unity State in early 2017, and that people in these areas continue to struggle to survive in near-famine conditions. The conflict in Nigeria is going on eight years now. Aid groups such as Oxfam and UN agencies (including the Famine Early Warning System) have been warning the world about these deteriorating situations for some time. Humanitarian organizations have been seeking funds to head off a famine, but without the resources and successful efforts to end wars and help people withstand drought, we now have millions of people in four countries without enough food. We (governments, the UN, aid organizations) know what to do, because the world has been successfully fighting famine for more than a century. In 2011, more than 250,000 people in Somalia lost their lives when the world ignored repeated warnings after the failure of rains in the region. We should not wait until the situation becomes really dire, with people (many of them children) starving and dying. We need to raise awareness and mobilize support months and years earlier. 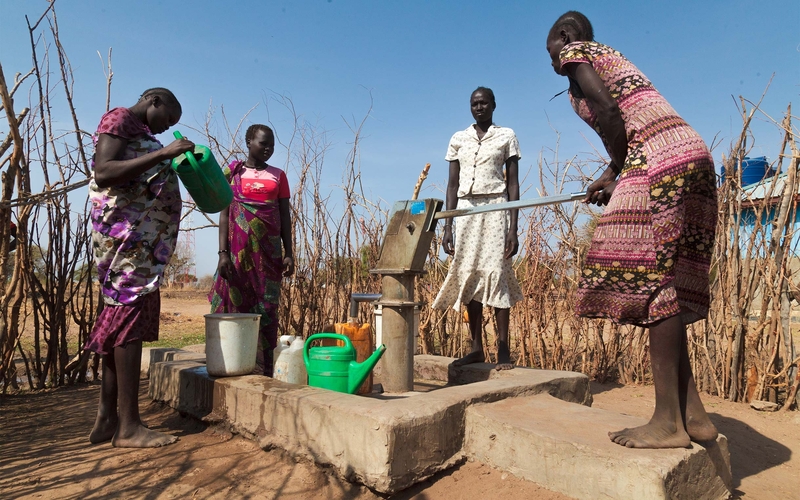 Clean water for drinking, cooking, and bathing is essential in any humanitarian emergency to avoid deadly water-borne diseases such as cholera. But any stomach ailment from dirty water or poor hygiene will rob people of the nutrition they can derive from whatever food they can find. Children under 5 are particularly vulnerable. Oxfam helps improve and repair wells, and trucks in water to areas where there is none. Proper sanitation and hygiene are essential for preventing disease. Oxfam helps construct latrines and distributes hygiene items like soap so people can wash their hands. When food is available in markets, but might be scarce or very expensive for some, Oxfam distributes cash (sometimes in exchange for labor). Oxfam also distributes emergency food when necessary. In areas where farmers can plant crops, Oxfam is helping supply seeds, tools, and other assistance so people can grow their own food. We also help farmers raising livestock with veterinary services, animal feed, and in some cases we distribute animals to farmers to help restock their herds. Oxfam works with a network of local partners to help farmers improve and insure their harvests, create drought early-warning systems, and help people find other ways of earning money for food when crops fail. Much of the water and sanitation work Oxfam does is in close collaboration with local groups. You can see a more detailed explanation of our activities in Nigeria, Yemen, South Sudan, and Somalia on our hunger and famine crises page. Oxfam is urgently seeking funds to help communities that are facing dangerous levels of hunger, whether due to chronic poverty, drought, or conflict. Even during normal times, most farming families in sub-Saharan Africa struggle to find enough food during the growing months. This is also the rainy season, so delivering food and water is even more challenging as many roads become unpassable. In countries experiencing conflict, we are advocating for measures to protect humanitarian access to people requiring assistance, and to find ways to end the fighting that is pushing so many people into hunger. We are also advocating for more international funds that can help people survive the current crisis, and develop the means to withstand the next one. Oxfam is advocating for governments to invest in programs that will help farming communities become more productive, and survive dry times on their own. Millions of people are on the brink of starvation. Meet a few of the individuals working hard to overcome hunger, and find out how you can help.